Puma Stag White Hunter that is mint/near mint in older all wood box. It has not been sharpened or used but it does have some very light rub marks, which are probably from going in and out of the sheath. Very minor! It comes with the original leather sheath and paper work on the green string with small gold colored paper booklet. The booklet is all German text, the cover is a little ruff but the inside paper is excellent. 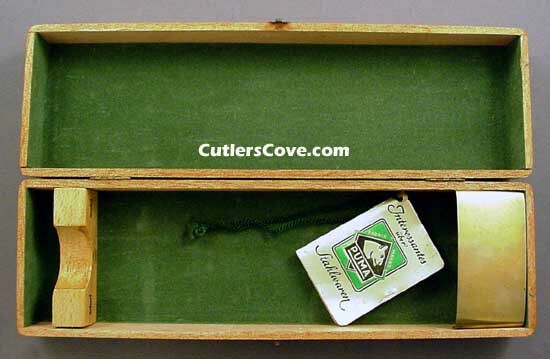 The wood box has the PUMA logo stamped inside the box on the wood support for the handle and the inside of the box is lined with green felt. 10-5/8" overall. 6" stainless skinning blade. Genuine Stag Handles with aluminum finger guard. Full tang construction with lanyard hole. Leather belt sheath. 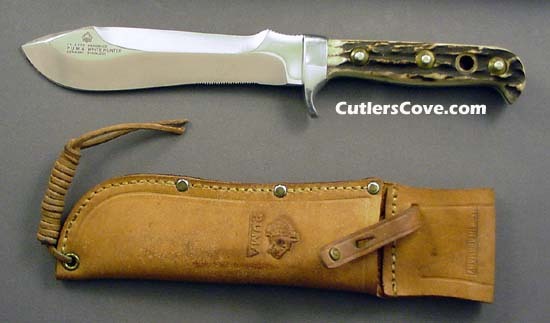 It is serial number 43782 stamped on the guard and is model number 11 6375 marked on the blade out near the point. Keep in mind that a mint condition knife made in prior years has a value in excess of that of the same model made today --- the earlier made, the higher the value! Do not know the year when it was manufactured but maybe sometime between 1964 and 1987.